I’m continuing to experiment with pot roast. This was inspired by Cooks Illustrated. 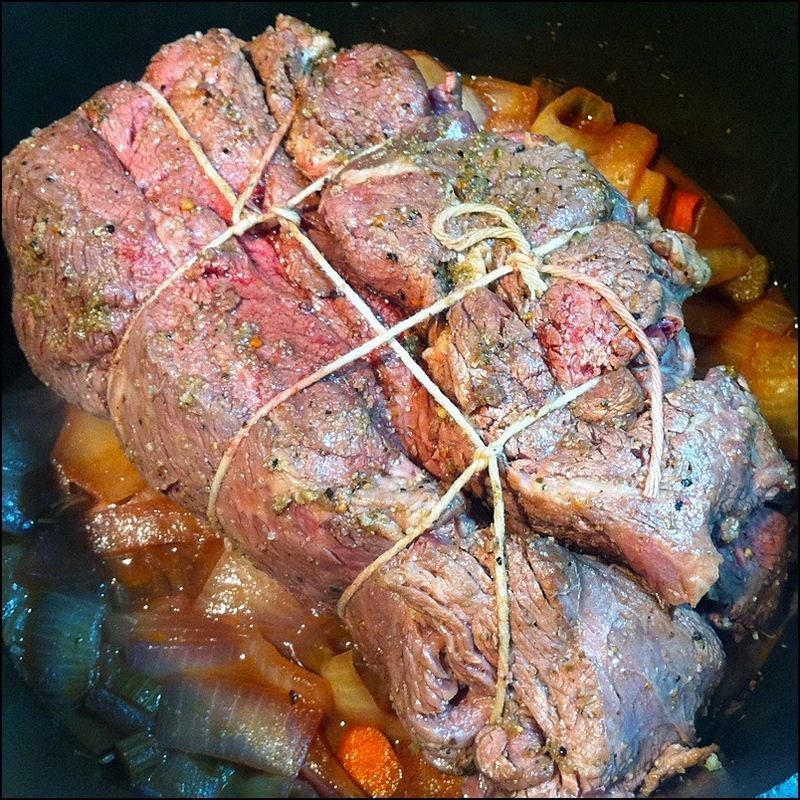 (1) Pull the roast apart at its natural seam and trim any large knobs of fat. Sprinkle with 1T salt and let stand an hour at room temperature. (2) Pre-heat oven to 300. Make sure the rack is low enough to accommodate your Dutch oven with lid. (3) Heat 2T olive oil (medium-high) in a heavy-bottomed Dutch oven. Season the roast with Mrs. Dash and some crushed black pepper; brown on all sides. Remove the meat from the pan. (4) Add 1-2T olive oil to Dutch oven if needed. Add onions and cook until softened. Add carrots and celery; cook, stirring occasionally, about 5 minutes. Add the potatoes, then the garlic. Stir in 1c broth, 2/3 c wine, Worchestershire sauce, vinegar, tomato paste, bay leaf; bring to a simmer. (5) Tie the meat into a loaf shape for even cooking. Nestle on top of vegetables. (6) Cover pot tightly with aluminum foil and cover with lid. Cook until fully tender, 3.5-4 hours. Turn the roast over halfway through cooking. (7) Remove roast to cutting board; tent with foil. Strain liquid through mesh strainer into 4-cup liquid measuring cup. Discard bay leaf. Transfer vegetables to blender. (8) Allow liquid to set for at least 5 minutes, then skim off any fat. Add beef broth needed to bring liquid to 3 cups. Place liquid in blender and puree about 2 minutes. Transfer to medium saucepan and bring to a simmer. (9) Remove twine from roast and slice against the grain into 1/2-inch thick slices. (10) While roast rests, add remaining 1/3 c of wine to sauce; season to taste. Spoon half sauce over meat. NOTE: This recipe does not include vegetables to accompany the roast. If you want vegetables to accompany the roast (1 lb carrots, 1 lb potatoes, 1-2 onions — chopped) then put them on top of the roast when you turn it over at the half-way point. Then remove these large cooked vegetables from the pan before proceeding with step (7). If water is the first ingredient, run away! Beef stock should be the first ingredient. Best: concentrated beef stock. Second best, having both beef stock and beef extract in the ingredient mix.